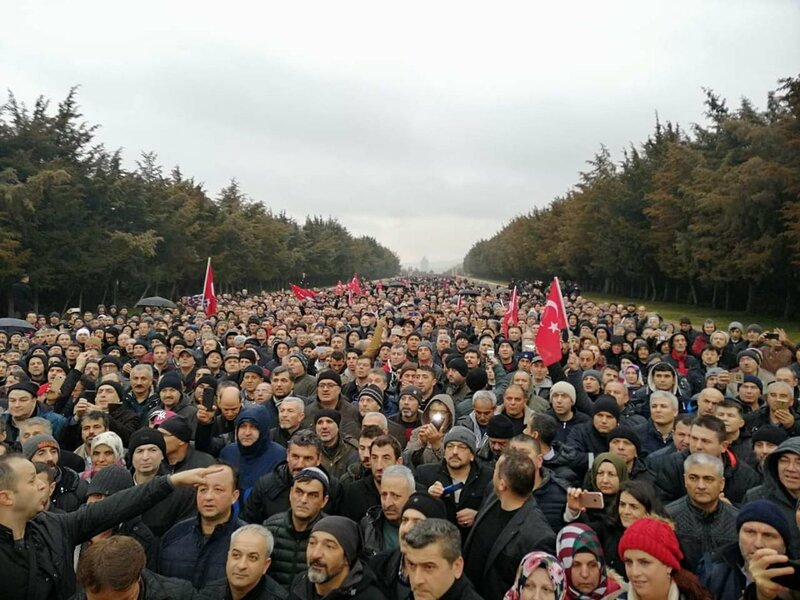 THOUSANDS of Retired Age Barrier (EYT) won’t give up on their battle as they stormed into every corner of Ankara on Saturday to make their voiced heard. The YET victims held a meeting to further discuss the challenges they have faced over the years – an issue of consternation in Turkey in the past few years. The issue at hand is that there are victims who could not manage to qualify for retirement, although they paid the required premiums for retirement following the resolution which was taken and accepted in 1999. The large crowd saw other ordinary citizens failing to enter the cultural centre as it was packed to capacity by the YET victims. Before they packed the Nazım Hikmet Cultural Center in the suburb of Yenimahalle in Ankara, the victims visited Antıtkabir, the monumental tomb of Mustafa Kemal Atatürk, the founding father of modern Turkey and paid their tributes. The EYT victims and their families were also supported by many deputies from the Republican People’s Party (CHP) and the Good Party (İyi Party), unionists, non-governmental organization (NGOs) were among the attendees of the meeting. In their meeting, EYT victims gathered at Anıtkabir and stood in homage in front of the mausoleum of Atatürk. According to a news report by Cumhuriyet, EYT victims said vowed to punish the government through the ballot box. Local elections will be held at the end of March in Turkey. Mansur Javaş, Joint Ankara Metropolitan Mayoral Candidate of CHP and İYİ Party, took to Twitter and told the EYT they will pay the health expenses of EYT victims from the municipality budget. He stated they would pay the General Health Assurance (GSS) debts of them. Pointing out he could not attend the meeting due to the Candidate Introductory Meeting, Yavaş noted they will do whatever in their power until a radical solution is found to EYT problems. The EYT victims have been struggling following the ‘backtrack operated regulation’ which came into effect in 1999. They could not be accepted as retirees, although they paid required premiums for retirement. As they did not take any conclusion, then gathered together and established the EYTSYDD. Foundation regularly organises meetings to make their voice heard by the general public and uncaring government.